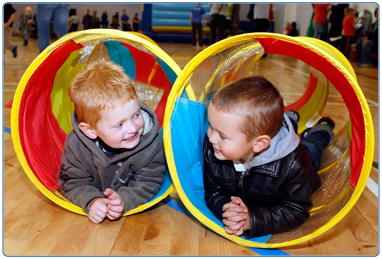 South Lanarkshire Leisure and Culture offers a wide range of activities for children, from tots to teens. Our ACE / Tiny ACE membership gives access to activities suitable for children 12 weeks to 15 years, such as football, gymnastics and trampolining; as well as our arts and crafts, music and drama. Golf, swimming, racquet sports, use of our gyms and fitness classes (suitable for 12 years old and above), and access to soft play (for children aged 2 to height 4 foot 9 inches) at Larkhall Leisure Centre, Burnbank Centre and The Fountain, are also included in these memberships. These activities are also available on a pay-as-you-go basis. General sports/fitness - To book a Fitness class you can book online or call the centre directly. Contact the appropriate Starters Office to book a round of golf. For other activities such as swimming, just check the opening hours and go along at the appropriate time. As well as all of these fantastic activities, you can give your child a birthday party to remember at several of our facilities. For regular updates on activities for pre-school and primary school aged children, ‘like’ our Children’s Activities Facebook page today!